It has been 21 years since Southcentral Foundation’s RAISE program graduated its first student interns. On Aug. 4, RAISE celebrated another 69 students who completed the program. During this summer’s session, the six groups of student interns not only gained on-the-job experience, but also had the opportunity to develop a number of different skills geared toward helping their personal, school, and work lives. Throughout the summer, interns worked in a number of departments across SCF, including Executive and Tribal Services Administration, facilities, human resources, physical therapy and exercise, and more. Working alongside employees in these departments gives perspective and opportunity for students to decide whether they would consider working in that particular field. In preparation for adulthood and independent living, interns participated in a number of different trainings and activities. Some of the trainings included Heartsavers CPR, administrative support skills, and drug awareness. With this knowledge, they gained hands-on experience and learned about the negative impact that drug use can have on their lives. In addition to life skills, RAISE participants learned team building, mentorship, personal financial wellness, and portfolio development. They also participated in a workshop called Step-Up to Writing. The workshop required the submission of four written essays aligned with SCF’s core competencies: customer care and relationships; communications and teamwork; improvement and innovation; and skills, abilities, and professional development. Writing essays helps students improve their writing skills and counts toward half of a credit for school. They also learned different job application skills, including what an employer is looking for in a reference, how to structure a resume, and interactive interviewing techniques. At the end of July, the RAISE program went on a three-day camping trip to Spirit Lake. During this time, the interns had the opportunity to work on team building and spent time with SCF’s President/CEO and Board of Directors. They also traveled to the Kenaitze Indian Tribe’s fishnet where they picked and helped fillet fish. With the completion of RAISE, students are better prepared to enter the working world and have an increased understanding of writing, job application, and professional development skills. 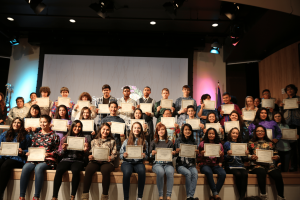 SCF is committed to guiding Alaska Native and American Indian youth on their journey to adulthood and career success through RAISE and other related programs.